Vertebral artery dissection has been recognized as an uncommon cause of ischemic stroke. However, it is less well known as a cause of subarachnoid hemorrhage. Even if dissecting aneurysms of the vertebral artery are rare, their importance arise from their high morbidity and mortality with rebleeding occurring more often than in cases of saccular aneurysms. Dissecting aneurysms of the vertebrobasilar system are a complex entity which requires a rapid and effective treatment to prevent rerupture. The sole stenting technique stands as a promising approach, allowing to occlude the aneurysm while preserving the vessel patency and reconstructing the diseased segment. Santos-Franco et al. present a cogent review of the literature regarding dissecting vertebrobasilar aneurysms and present their own series of such lesions treated with parent vessel preservation. At our institution, treatment strategy usually is dictated by the relationship of the aneurysm to the PICA. In most cases, because patent contralateral V4 segment collateral exists, lesions noncontiguous with PICA are usually treated with parent vessel sacrifice. When the dominant vertebral artery is involved or extension to the basilar artery occurs, test balloon occlusion is necessary prior to parent vessel occlusion. For lesions occurring at the PICA origin, stent-assisted coil embolization, or rarely, standalone stenting or double stenting, is employed. In cases where the dissection incorporates the proximal segment of PICA, PICA–PICA or occipital artery–PICA bypass followed by parent vessel sacrifice is performed. While maintaining parent artery patency is an attractive option, it is important to emphasize that in suitable situations, endovascular coil occlusion of the diseased parent artery remains the most effective manner to obliterate these lesions. Stent-assistant coil embolization can obviate the need for more invasive surgical intervention, however, does carry the risk of aneurysm recurrence and potential for rebleeding [1, 2]. Admittedly, the literature regarding parent artery preservation in the setting of these lesions is sparse. However in such patients, close angiographic follow-up, as the authors recommend, is crucial. 1. Albuquerque FC FD, Han PP, Deshmukh VR, Kim LJ, McDougall CG (2005) Endovascular management of intracranial vertebral artery dissecting aneurysms. Neurosurg Focus 18:E3. 2. 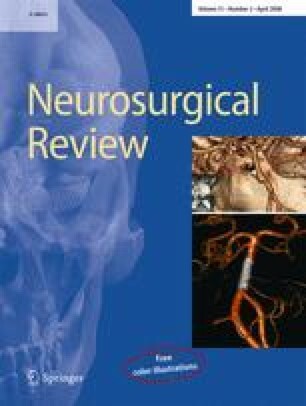 Yuki I, Murayama Y, Viñuela F (2005) Endovascular management of dissecting vertebrobasilar artery aneurysms in patients presenting with acute subarachnoid hemorrhage. J Neurosurg 103:649–655. This article reviews the pathology, epidemiology, clinical features, and imaging features of dissecting aneurysms of the vertebrobasilar system. The authors present their "sole stenting technique" as a reconstructive technique that preserves parent artery flow, along with some beautiful case examples from their series of 11 patients. This technique is both intriguing and promising, but there are unanswered questions associated with it. The time interval from stenting to complete occlusion is unpredictable, ranging from 36% at the time of treatment to 91% at 1 year. Efficacy in preventing future hemorrhage with dissections, particularly those presenting initially with hemorrhage, is unproven. Although none were observed in this experience, the small number of patients and short follow-up do not address this issue satisfactorily. Recanalization without hemorrhage is also a problem that occurred in one patient who required additional treatment. Still, reconstructive techniques will always be more appealing than deconstructive ones with these dissecting aneurysms and with other aneurysms, generally. These preliminary results with the sole stenting technique are exciting, and it deserves further study in a controlled, multicenter trial.